TRIVIA of Noh : Q131 : Does the bell in "Dōjōji" really exist? | Home | Trivia | Q131 : Does the bell in "Dōjōji" really exist? Does the bell in “Dōjōji” really exist? The origins of the popular Noh play “Dōjōji” lie in the tragic love story of Anchin and Kiyohime. This was passed down at Dōjōji Temple in Wakayama Prefecture. Long after the temple bell was lost in the lovers’ tragedy, a new one was dedicated at the temple and a memorial service was held in 1359 (Shōhei 14). During the service, a woman dancer appeared, dropped the bell and hid herself inside it. The bell was lifted by the monks' prayers, but the woman transformed herself in a monstrous serpent and disappeared into the Hidaka River. This is the story depicted in the Noh play “Dōjōji.” After this, the bell produced bad sounds and the area suffered continuing epidemics and calamities. As a result, the bell was discarded in the mountains. 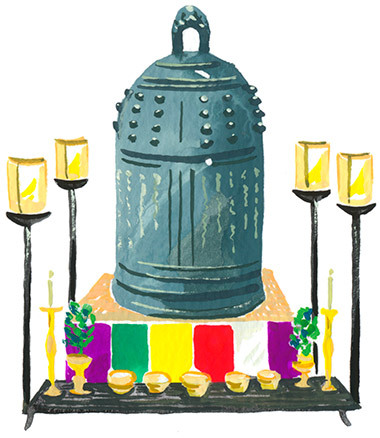 About 200 years later, during the Tenshō era, the bell was discovered in the mountains by Sengoku Hidehisa, a general in the Negoro attack commanded by Toyotomi Hideyoshi. Sengoku used the bell as an alarm signal in battles and took it back to Kyōto. The chief abbot and head priest at Myōmanji Temple, Nichiin, then lifted Kiyohime's curse from the bell. Since then, it has produced a beautiful sound and been handed down in the temple as a treasured holy bell. The actual bell is smaller than might be expected. Film stars Ichikawa Raizō and Wakao Ayako, as well as Kabuki actor Nakamura Kanzaburo XVIII, have all visited the bell with a strange destiny to pray for the success of performances. Numerous people go there to pray for success in the performing arts.